Zlatan Ibrahimovic’s failure from the spot could be compounded by a spell on the sidelines after 10-man Bournemouth secured a memorable 1-1 draw at Old Trafford. Ugly scenes and poor officiating overshadowed a thrilling lunchtime encounter as Marcos Rojo’s first ever Premier League goal was cancelled out by Josh King’s penalty as the first half ended chaotically. 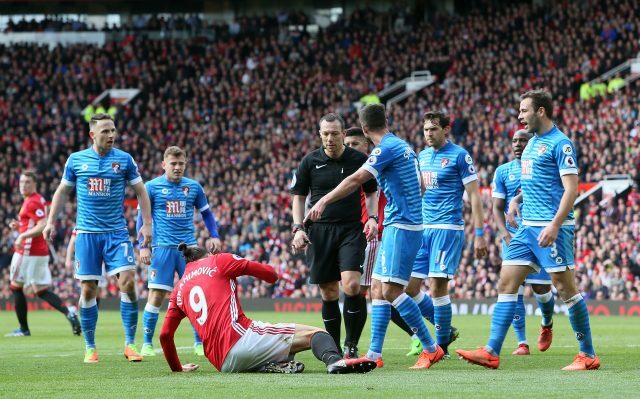 Andrew Surman received the first red card of his career – awarded once blundering referee Kevin Friend realised he had booked the Bournemouth captain twice – having reacted angrily to Ibrahimovic’s elbow on Tyrone Mings, who moments earlier stamped – inadvertently or otherwise – on the United striker. With an exciting contest finely poised at 1-1 just before the break, a series of flashpoints culminated in Surman’s stoppage-time dismissal. Both Mings and Ibrahimovic could have been dismissed – the former for a stamp on the Swede’s head which only he can determine the intent of, and the striker for a subsequent elbow, seemingly retaliatory. Yet Surman was the only one punished for then shoving Ibrahimovic, and even then it took referee Friend a long time to realise it was the second time he had brandished the yellow card at him. Artur Boruc. The Pole was kept busy from the start as he made an early one-on-one save from Paul Pogba and made further stops from Anthony Martial and Ibrahimovic. He was already the leading contender for the man-of-the-match award when he guessed the right way to keep out the Swede’s 71st-minute penalty in front of the Stretford End. On the 39 occasions a visiting team have had a player sent off at Old Trafford in the Premier League, none have gone on to win. In those instances United’s opponents managed nine draws, including this one by the Cherries, and 30 defeats. Manchester United: David De Gea 6, Antonio Valencia 6, Phil Jones 5, Marcos Rojo 7, Luke Shaw 7, Michael Carrick 7, Paul Pogba 7, Anthony Martial 7, Wayne Rooney 6, Juan Mata 6,Zlatan Ibrahimovic 6. Substitutes: Marcus Rashford (on for Shaw) 5, Jesse Lingard (on for Rooney) 6, Marouane Fellaini (on for Carrick) 6.Bournemouth: Artur Boruc 9, Adam Smith 6, Steve Cook 7, Tyrone Mings 6,Charlie Daniels 7, Andrew Surman 5, Harry Arter 6, Ryan Fraser 6, Marc Pugh 6, Joshua King 7, Benik Afobe 6.Substitutes: Dan Gosling (on for Pugh) 7, Baily Cargill (on for Mings) 7, Max Gradel (on for King) 6. Get tickets for our Europa League home leg v Rostov – on sale now to all #MUFC fans!